The SURVIVOR FILTER PRO Microfilter is the best of its kind on the market today. With a filtration level to an unbelievable 0.01 microns, the highest level available on the market today for any kind of portable water filter. Thanks to its TRIPLE FILTRATION (Cotton Mesh Filter, Carbon Filter and UF Filter (Medical Grade). Tested at Multiple USA labs to show Log 5 Removal 99.999% of Protozoa (Cryptosporidium, Giardia and Parasites) Log 5 Removal 99.999% of tested VIRUS (Phi X-174), STAPH and BACTERIA. 99.5% Mercury and 93% Lead Removal which Matches or Exceeds Most Home Systems. See test Reports under FAQ section of this Page. Super Fast Flow Rate of 500ml (17 OZ) per minute. Can be used directly from fresh water source, pumped into the attached cup, OR pumped into any portable hydration pack. Perfect for filtering large jugs of water for the whole family! Built of strong Quality Materials. Shell is ABS Material (Same Material Used on Car Bumpers), Polysulfone Medical Grade Ultra Filter (Same Material Used in Visors of Apollo Astronauts), Food Grade Activated Carbon and Handle Contains Steel Bar Inside for Extra Support. BPA Free, Comes with all internal filters and tubing, detachable Drinking Cup, Travel Bag, Detailed instructions and How to Use Manual. All 3 filters Filters (Ultra and Carbon) are removable and can be cleaned or replaced by purchasing on our website as needed. BPA Free and Weighs only 12.8 ounces, 6.5 inches long and Comes with detailed instructions and How to Use Manual. Can be used directly from a freshwater source, pumped into the attached cup, OR pumped into any portable hydration pack. 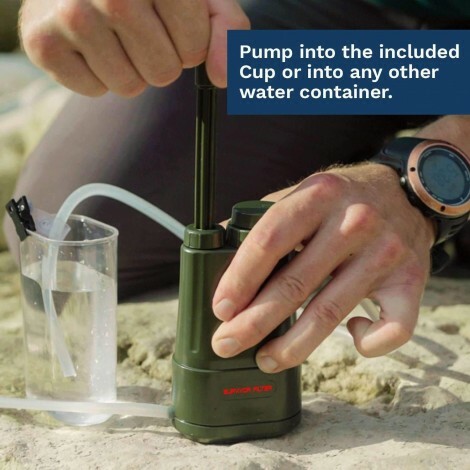 The Survivor Filter PRO combines 3 Separate Stages of Filtration utilizing a 2 Cleanable Membrane Ultra Filters (A 0.1 Micron Pre-Filter and a 0.01 Micron Internal Ultra Filter) as well as an internal Carbon Filter to deliver crisp tasting, clean, filtered water. This 0.1 Micron Ultra Filter acts like a barrier to help remove algae, Giardia, E. Coli, Protozoa, and Cryptosporidium. The Pre-Filter is designed to be backwashed (Cleaned) with the included Syringe in the Wild Up to 100, 000 Liters. Located inside the device, the Carbon Filter is designed to reduce heavy metals, chemicals, pollutants and improve the taste of the water. The Carbon Filter elements is easily replaceable and will last up to 2000 Liters. The final stage Internal Membrane acts as a barrier to remove the remaining pathogens that make it through Stages 1 and 2 such as a Virus (Phi-X 174). Once the water has passed through the first three stages Testing shows removal of 99.999% of Tested Virus (Phi-X 174), Bacteria, Parasites and Staph. The Internal Membrane is designed to be backwashed with the included Syringe and re-used up to 100, 000 Liters so you never need to throw out your device. The Survivor Filter PRO is Independently Tested in the USA according to NSF/ANSI Standards and to filter Bacteria (E.Coli), Staph (S. aureus), Parasites (Cryptosporidium and Giardia) and Virus (Phi X174) to 99.999% and significantly reduce heavy metals making it safe to use in most natural bodies of water throughout the world. Is The Survivor Filter PRO Ready To Use Out Of The Box? Yes! We are happy to say that the PRO is ready to use as soon as you receive it! While the Survivor Filter PRO is ready to use right out of the box, we recommend that everyone tests it out and makes sure they know how to operate it. This allows you and your family to familiarize yourselves with the product so in case of an emergency, you will already know how it works. How Do I Use This Product In Cold Temperature? What Is The Flow Rate On The PRO? 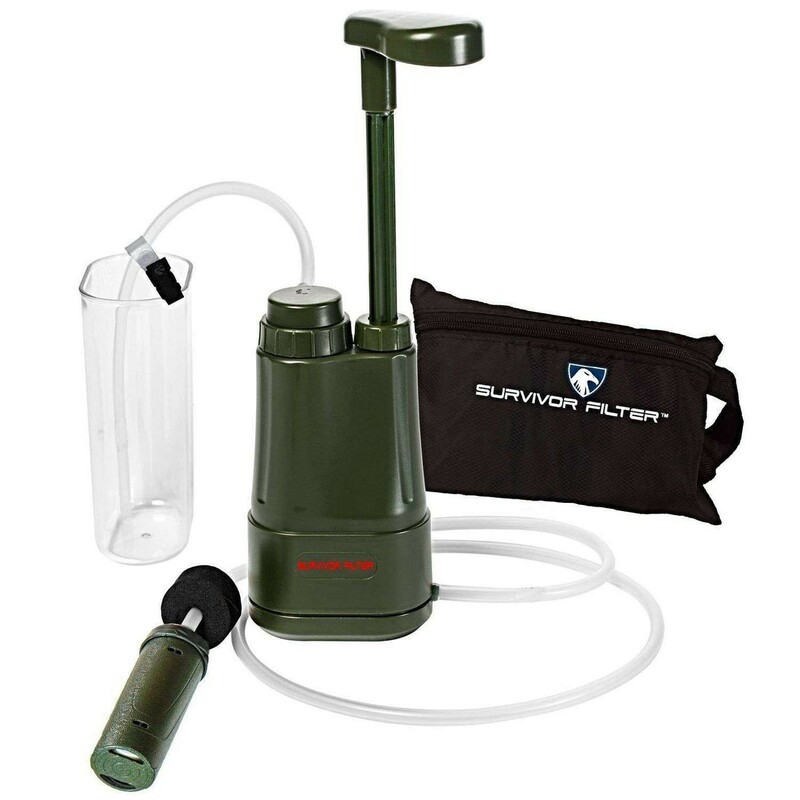 The Survivor Filter PRO boasts a Super-Fast Flow rate of 500ml (17 ounces) per minute. Other popular filtration systems have a flow rate half that. A slow flowing filter can become frustrating when used for extended periods of time. When water flow through the Ultra Filter becomes reduced, then it’s time to remove the Ultra Filter for cleaning or replacement. To clean the Ultra Filter, follow the manual to disassemble the Survivor Filter PRO, filter and backflush by running clean fresh water through the filter in the opposite direction with the syringe into the Internal and External Ultra Filters and then re-install and you are good for more use. If flow rate is still reduced, this is a sign that you will need to order a new carbon filter replacement. How Many Gallons Can This Product Process Before Cleaning Or Replacement Filters Is Needed? The Ultra Filter Pre-Filter and the Inter can be reused up to 100,00 liters (26,417 gallons) before they should be replaced. The Carbon Filter can be re used up to 2,000 liters (528 gallons) before being replaced. The filters can be cleaned and/or replaced when you start to notice that the flow rate of your filter is decreasing, and you have already tried cleaning and backwashing (see below for more information about backwashing your filter) with no improvement to the flow rate. More frequent cleaning or replacement may be necessary depending on the quality of the water being filtered. What Is The Shelf Life Of The PRO? Keeping the Survivor Filter PRO in storage for any length of time will not reduce its lifespan. Even if you are keeping the products in long term storage, we recommend taking them out and testing them every once in a while. This is to ensure that the product still works and that you/your family know how to use it. It is also best to ensure that every piece of your Survivor Filter PRO is dry before putting away for long-term storage. How Do I Clean The PRO? Cleaning the filter elements of the Survivor Filter PRO is a quick and simple process. Check out the video below for cleaning instructions. Cleaning the Ultra Filter Pre-Filter and internal Ultra Filter after each trip greatly extends their life. Make sure to also completely air dry the filter elements before placing them in storage. How Do I Backwash The PRO? Backwashing your filter can be done when you start to notice the flow rate of your filter decreasing. A slow flow rate can be caused by small particles blocking the Ultra Filter Pre-Filter. Backwashing flushes water back the opposite way through your filter to dislodge particles that are slowing down your filter. Have a look at the video below for detailed backwashing instructions. Also, check the manual for details on backwashing using the included syrine. How Do I Disassemble The PRO? Check out the video below for simple assembly and disassembly instructions. The Hose Is Kinking And/Or Collapsing As I'm Trying To Pump Water. How Can I Fix This? Kinking and collapsing in the inlet/outlet hose could be a result of air being trapped in the chamber of the PRO unit. First, we recommend making sure the Pre-Filter is fully submerged into the fresh water source as this will prevent air from entering the system. If air enters the system, it may make pumping difficult and make the hose kink. Second, we would recommend disassembling and removing all components of the PRO to release any air trapped in the system. Make sure to shake out the excess water and then reassemble. Where Can I Purchase Replacement Filters? Replacement filters are available right on our website here. Official Replacement Carbon Filter for the Survivor Filter PRO and Electric PRO X Filter Systems. Made from Food Grade Coconut Shells. Can be re-used up to 2,000 Liters (528 Gallons) before replacing. Designed to Help improve the taste and odor of water and to help catch the chemicals that make it through Stage 1 (Ultra Filter Pre-Filter). Outer Shell Made of Military Grade BPA Free ABS Material. Beware of imitations and use only Official Survivor Filter replacement filters to keep your Survivor Filter PRO in top condition. Durable and Well-Made: The Carbon Filter attaches using a “push and twist” motion to keep it secured onto the internal Ultra Filter. Features an “O” ring where it connects to the other replacement filter, which helps keep the device watertight. Official Replacement Ultra Filter for the Survivor Filter PRO and Electric PRO X. The Ultra Filter also features an “O” ring where it connects to the main water filter, which helps keep the device watertight. Beware of imitations and use only Official Survivor Filter replacement parts. All Survivor Filter products are shipped from North America.